Yours is the 1359596 th visit. The Supreme Master Ching Hai's S.M. The S.M. Celestial Clothes Fashion Show debuts at New York's Lincoln Center. Paris models have been especially invited for the occasion. On April 15, Master Ching Hai (recipient of the World Peace Award and World Spiritual Leadership Award) held the first show of the grand S.M. Celestial Clothes worldwide exhibition tour at the Lincoln Art Center in New York. Guests from all over the world gathered to appreciate the show. Among them were the German Ambassador in New York, Dr. Erhard Holtermann; Germany's famous opera singer, Ms. Hildegard Behrens; and a number of New York government officials. Before the occasion began, many guests came early to the Exhibition Hall at Lincoln Center, where they found a variety of art work on display, designed by Master Ching Hai. These included Her paintings, a variety of lamps, and the splendid and beautiful first, second and third series of the S.M. Celestial Jewelry. There was one thing worth special mention: Crowds of people gathered around the counter displaying the S.M. Celestial Jewelry Collection. Made of the finest diamonds, precious gems and Swiss gold, they were the focus of audience members prior to the show. Wholeheartedly, they praised the collection as belonging only to heaven. Each piece of jewelry bore a particular message reminding people to nurture their inner beauty and wisdom. When the show began, one after another, the brilliant, extremely elegant and uniquely designed S.M. Celestial Clothes were displayed before the audience. 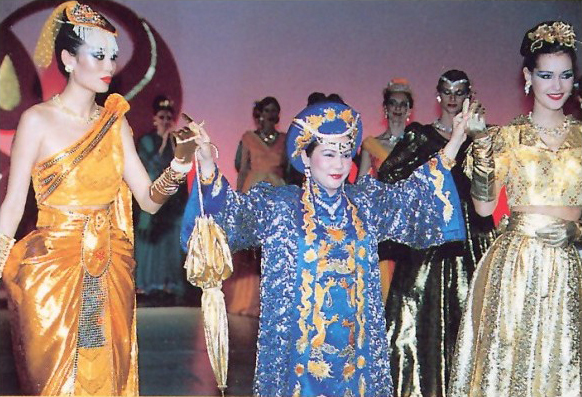 The fashions were exhibited by top models from Paris, amid musical compositions by Master Ching Hai and other of classical pieces of music. The audience's response was exceptionally warm, demonstrated by their frequent loud applause and cheering. They even clapped their hands in rhythm to the music. The models were also affected by the atmosphere. Their movements became increasingly more graceful and smooth. Each of their gestures successfully depicted the creative intent conveyed by Master Ching Hai's designs. These clothes were not only impressive on the show bridge, but are also suitable to be worn on all types of occasions, being both practical and elegant in style. Besides satisfying the public's requirements for external beauty, the S.M. Celestial Clothes designed by Master Ching Hai are even more distinguished in that they remind people of the necessity to develop their own inner beauty, and to elevate their spiritual level. 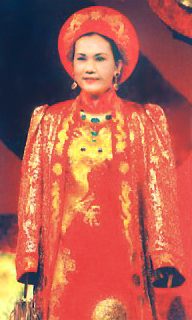 Toward the end of the show, under the brilliant spotlights, Master Ching Hai appeared on stage dressed in a bright red evening gown embroidered with golden dragons. Instantly, the audience rose and cheered fervently. Many spectators rushed to the front of the stage to catch a glimpse of the elegant and beautiful demeanor of Master Ching Hai. Thus, the evening reached its climax. After the show there was a buffet, which was attended by fashion designers, the press, many prominent people from society and government officials. The fashion show's tour was successful at its first presentation in New York, and will next move on to London and Paris. Remark: The net proceeds of this show will be donated to: the Gay Men's Health Crisis, the Coalition for the Homeless and DIFFA. Master Ching Hai is extremely versatile -- She writes poems, paints, plays a variety of musical instruments, composes songs, sings, and creates many other works of art. Her meticulous and gentile fashion designs not only highlight the exalted and elegant bearing of a woman, but also consider her innate modesty. Any woman wearing Master's Celestial Clothes looks completely poised and confident; and observers can enjoy the pure aesthetic quality of what they see and spontaneously praise the masterpieces of God's creation. The beauty of the S.M. Celestial Clothes is that they integrate a broad array of elements from various cultures and the essence of wisdom, transcending the limits of space and time. Thus, they encompass the beauty of all ages, and appeal to people of both East and West. The touring S.M. Celestial Clothes Fashion Show made its international debut, and contained a wide and sumptuous variety of designs, which were distinctive, stylish, elegant and romantic. The fashions enable contemporary women active in various professions and social settings to competently play any beautiful role that God bestows upon them.